For the first time ever, governments, international organizations, and civil society addressed the catastrophic humanitarian consequences of the use of nuclear weapons at a conference in Oslo, Norway from 4-5 March 2013. The meeting was a huge success, with the participation of 128 governments, UN agencies, international organizations, and civil society. Evidence was presented on the immediate impact of a nuclear weapon detonation and governments and relief agencies alike concluded that no adequate humanitarian response would be possible. States and other actors convened again in Nayarit, Mexico from 13-14 February 2014 to discuss the global and long-term consequences of a nuclear detonation from the perspective and variables of the 21st century society. In his summary of the meeting, the Chair called for the development of new international standards on nuclear weapons, including a legally binding instrument. The time has come, he noted, for a diplomatic process to reach this goal, within a specified timeframe, identifying the most appropriate forum and on the basis of a clear and substantive framework. Calling for this process to conclude by the 70th anniversary of the bombings of Hiroshima and Nagasaki, the Chair described Nayarit as “the point of no return”. States and other actors will gather for a third conference in Vienna, Austria from 8-9 December 2014. This meeting will further explore the humanitarian and environmental impacts of a nuclear weapon detonation and will take a look at existing international law relevant to this issue. Starting with the 2010 NPT Review Conference, govenments officially expressed their "deep concern at the catastrophic humanitarian consequences of any use of nuclear weapons" and reaffirmed "the need for all States at all times to comply with applicable international law, including international humanitarian law." Following this, 16 governments delivered a joint statement at the 2012 NPT Preparatory Committee; and 35 governments did so at the 2012 General Assembly First Committee session, highlighting the catastrophic humanitarian consequences of nuclear weapons and calling on all states to intensify their efforts to outlaw these weapons. At the 2013 NPT Preparatory Committee, 80 governments joined in this statement on the humanitarian impact of nuclear weapons, and by the 2013 First Committee, 125 governments were on board. In addition, the Red Cross/Red Crescent movement adopted a resolution on the topic in 2011, which "finds it difficult to envisage how any use of nuclear weapons could be compatible with the rules of international humanitarian law, in particular the rules of distinction, precaution and proportionality," and urges states to abolish nuclear weapons. 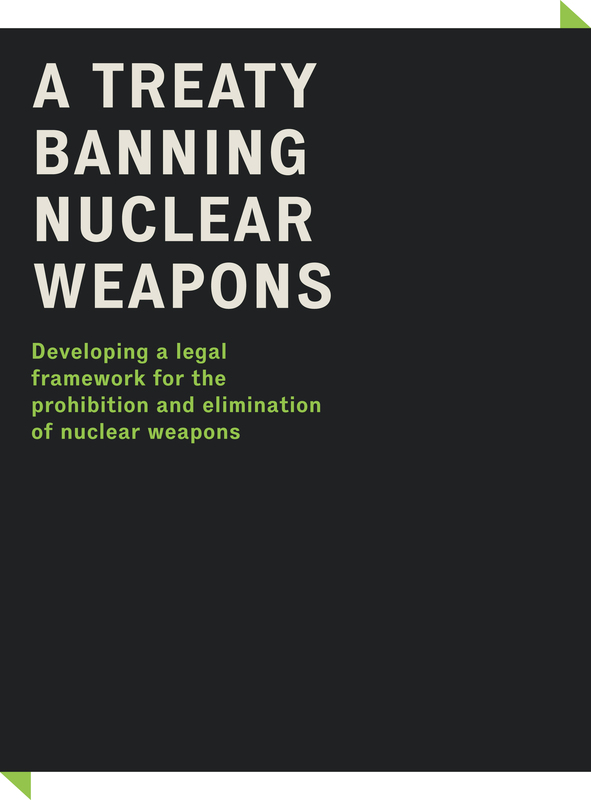 In 2013, the movement reconfirmed its commitment to a nuclear ban, adopting a four-year action plan towards the prohibition and elimination of nuclear weapons. This paper, published jointly by Reaching Critical Will and Article 36, looks at possible principles and provisions of a treaty banning nuclear weapons; how it could be accomplished; and its potential normative and practical impacts. 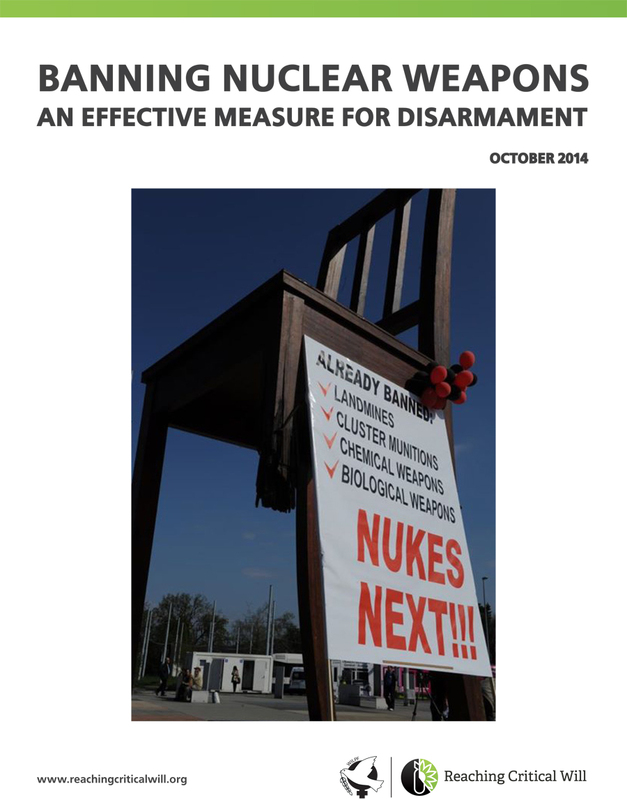 This paper explores the effective measures for nuclear disarmament presented by the New Agenda Coalition in its 2014 NPT working paper and argues that in the current context the most effective and achievable measure for nuclear disarmament is a treaty banning nuclear weapons. 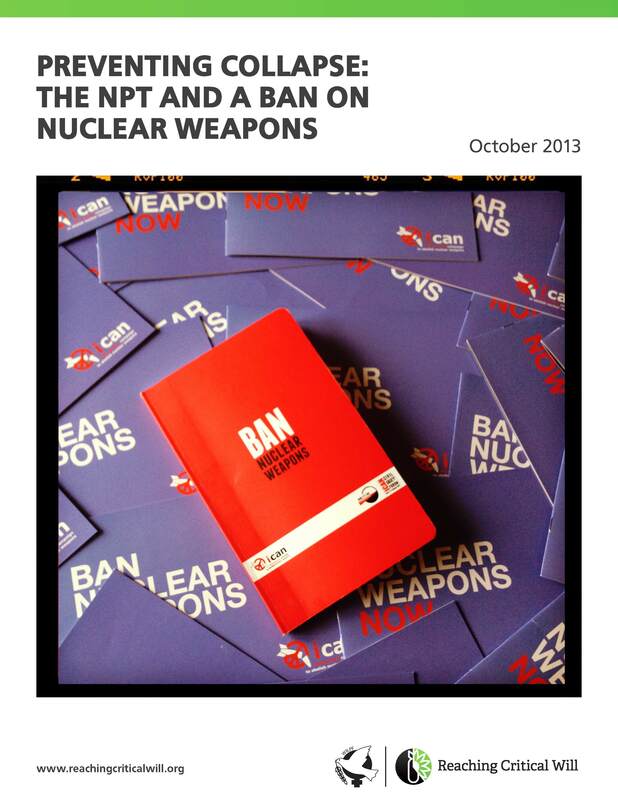 This paper examines the complimentarity between the NPT and a ban on nuclear weapons. It argues that rather than constituting a challenge to the NPT, a process to ban nuclear weapons that arises from the discussion around the humanitarian impact of nuclear weapons has the potential to prevent the NPT’s collapse.